Our blended version of the HAZMAT Technician Level III Responder course (8 hours online plus 8 hours hands-on classroom training) is designed to help workers meet the training requirements in OSHA HAZWOPER regulation 29 CFR 1910.120(q). Annual refresher training is required. This blended course is for workers with refreshed, adequate, verifiable FRO training completed within the last year. Additional HAZMAT Technician course options available. This course provides 8 hours of fully narrated online training. After completion of the online class, the student may attend the 8 hour classroom portion of the class. Our blended HAZMAT Technician Level III Responder course (8 hrs online plus 8 hrs in classroom) is designed to help Hazardous Materials Technicians meet the 24 hour training requirement per OSHA regulation 29 CFR 1910.120(q). Per OSHA, annual refresher training is required with sufficient content and duration to maintain competencies. This version of the course is for workers with refreshed, adequate, verifiable FRO training completed within the last year. Other available course options are listed below. Designed by Certified Outreach Trainers, this course includes up-to-date, high quality training created with your safety and learning as our top priority. The online portion of the course features interactive training modules, which combine audio and visual elements for maximum retention. The online training is available 24/7, using a computer with an internet connection. For your convenience, it can be completed over time, and your progress will be saved in our Online Training System (OTS) to the last section completed. 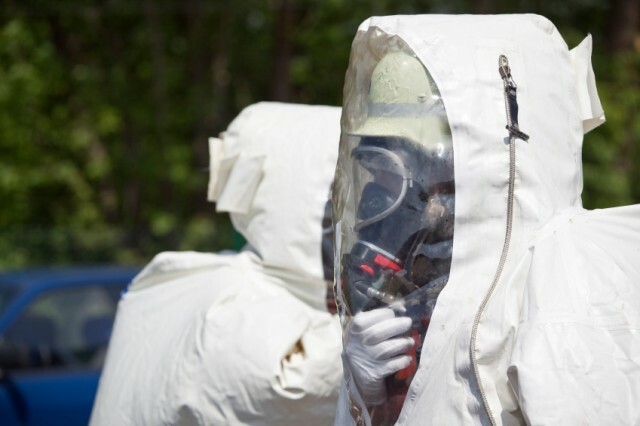 Our 24 Hour HAZMAT Technician course consists of three parts. In this course option, Part 1 has been previously completed by the student with adequate, verifiable documentation, and refreshed within the last year. Part 2 is completed online through our Online Training System (OTS) and consists of 5 modules with 22 sections that must be completed sequentially. Once the student has completed the online portion of the course, they may attend the 8 hour hands-on classroom portion.